Why women in community matter so much. Josie Posie, a passionate advocate for activating the feminine side of life. Today is the second Women’s March here in the USA. What began as an anti-presidential inauguration rally in 2017 became a much larger movement of women saying ‘No!’ to many of the ways our lives are affected by our existing culture. People all around the world are showing up today, for a second year in a row, in solidarity with the ideas and passions of women. I see the voices joining together as the expression of a generations’ old unspoken wish among many women, men and all genders, that the feminine becomes part of our leadership, that the way of openness, co-operation, wholeness and care, be included in our collective decision making. On a deeper level today I am feeling why I love working with women, either in small private groups or large communities. Possibly as the ladies marching today feel, it is because it answers my wish for all my sisters to realize how unique, valuable and beautiful they are — just because they are a woman. My own experience has been of a buried knowing of this my whole life, that I had forgotten how sacred I was. Which is why I love what I do. It heals me right along with my students. I was given an invitation in 2006, to continue as part of a lineage of teachers when my teacher retired. I did not fully accept it as the mission it truly was until 2012. Since then, I have been lovingly committed to teaching ‘Tantric Belly Dance’ to women (and sometimes all genders) all over the world. Tantric Belly Dance is a practice and an energy stream, that once felt, is a revelation of our own mystery and beauty. It is so exciting to do it, and even more amazing to master it. Sacred Dance in a sisterhood circle is empowering at the deepest (and sweetest) level. 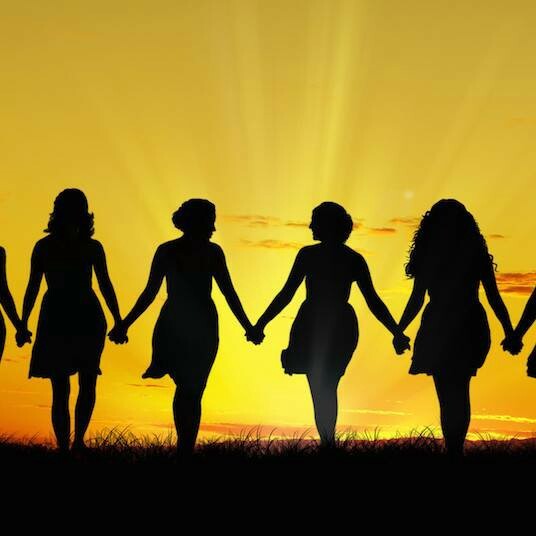 Joining a circle of Women in Community is one of the fastest ways back to wholeness. Starting a fitness routine, doing a cleanse, ‘getting out there’ and doing psychotherapy all work, but the loving space holding from strangers who become friends is all of these at once. Being seen and understood by your fellow humans is the number one healer of our personal and collective ills. See a story here of what being ‘seen’ in women’s circle was like. I know this is only just starting to be a reality for men, but please find or create your community too. There is a men’s community growing here. Or start an all gender one. There are many LGBTQIA ones already out there. Whatever circle you are in, you will see the transformation happen. We are waiting for the Brotherhood of new men, a Personhood of new people, that honor openness, co-operation, wholeness and care to emerge on the world stage with us. Josie is a facilitator of Divine Feminine teachings and igniter of the Flame of Mary Magdalene. She is deeply engaged in this rising wave of energy as it re-emerges on Earth. Josie started on her path in 1999, when she first went to Burning Man, met a Tantric priest, Ammachi, and a Tantric Dance teacher all in the same year. She became a student of all three until she became a lineage holder of the dance when her teacher retired. A natural seeker, she left her native homeland Australia, over 20 years ago. Josie has been a photographer, filmmaker, graphic designer, yogini, 5 Rhythms dancer, urban shaman, intuitive astrologer and painter. Her connection to spirit became very clear once she found the bhakti path and became lovingly devoted to the Divine Mother in her many forms.